I never had any intention to read Pretty Little Liars but once again my professor had other intentions. I’m kinda shocked that I liked it. Clearly not the best book ever but definitely entertaining and a quick read. 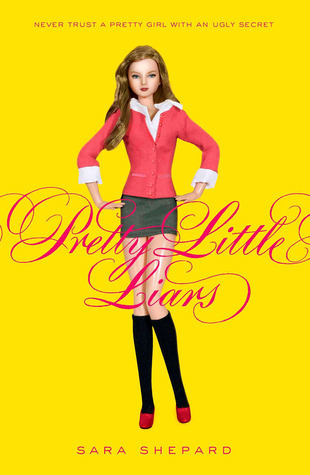 The first book in the series, Pretty Little Liars, is about five best friends – Emily, Aria, Hanna, Spencer and Alison. Alison is the girl everyone loves, but secretly hates because they’re envious. She is what you could call the secret keeper of the clique, the one that holds the deepest and darkest secrets of each of the girls that nobody else knows and that they wouldn’t dare share with another person. After a sleepover in seventh grade Alison disappears not to be seen again. Fast forward a few years later and the four girls are now juniors in high school. They have different social groups and none of them have talked since the disappearance of Alison. They all begin to get messages about their deepest, darkest secrets from a sender who goes by –A. Is this Alison? It has to be right? Guess again. The book definitely keeps you guessing and each person’s secrets are unraveled slowly but the book is not slow. Of course it ends with a cliffhanger, so we don’t find out the identity of A. I am intrigued enough to want to read the next book but at the same time I’m not running out to get the next book. Book two has made it on my list of books to read just not anywhere near the top of the list. This entry was posted in Young Adult and tagged Pretty Little Liars, Sara Shepard, YA Book, Young Adult. Bookmark the permalink.